2.3 km Syrian flag, al-Mezzeh, Damascus, SANA, June 15, 2011. As the intervention campaigns continue with new terrorist and “humanitarian” actors (literally) constantly emerging in the NATO-alliance’s theatre of death squads, it is worth reviewing some of the important points regarding the war on Syria. On March 29, 2011 (less than two weeks into the fantasy “revolution”) over 6 million people across Syria took to the streets in support of President al-Assad. 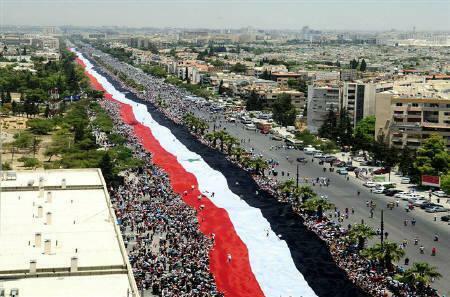 In June, a reported hundreds of thousands marched in Damascus in support of the president, with a 2.3 km long Syrian flag. In November, 2011 (9 months into the chaos), masses again held demonstrations supporting President al-Assad, notably in Homs (the so-called “capital of the ‘revolution’”), Dara’a (the so-called “birthplace of the ‘revolution’”), Deir ez-Zour, Raqqa, Latakia, and Damascus. Mass demonstrations like this have occurred repeatedly since, including in March 2012, in May 2014 in the lead-up to Presidential elections, and in June 2015, to note just some of the larger rallies. The most telling barometer of Assad’s support base was the Presidential elections in June 2014, which saw 74 percent (11.6 million) of 15.8 million registered Syrian voters vote, with President al-Assad winning 88 percent of the votes. The lengths Syrians outside of Syria went to in order to vote included flooding the Syrian embassy in Beirut for two full days (and walking several kilometres to get there) and flying from countries with closed Syrian embassies to Damascus airport simply to cast their votes. Within Syria, Syrians braved terrorist mortars and rockets designed to keep them from voting; 151 shells were fired on Damascus alone, killing 5 and maiming 33 Syrians. Prior to the events of March 2011 Syrians did have legitimate desires for specific reforms, many of which were implemented from the beginning of the unrest. In fact, President al-Assad made reforms prior to and following March 17, 2011. No surprise that NATO’s exile-Syrian pawns refused the reforms and a constitution which ensures a sovereign Syria secure from the claws of multi-national corporations and Western banks. In his article, “Decriminalising Bashar – towards a more effective anti-war movement,” writer Carlos Martinez outlined Syria’s positives, including its anti-imperialist, socialist policies; its secularism and multiculturalism; and—poignantly—its continued support for Palestinians and anti-Zionist stance. These are all points that contradict the lies spewed over the past nearly five years, and shatter the feeble justification for continuing to wage war on Syria. The number and nature of Syrians killed varies depending on which list one consults. Many talking heads draw from one sole source, UK-based Syrian Rami Abdulrahman of the so-called Syrian Observatory for Human Rights (SOHR) (run out of his home and based on information provided largely by unnamed “activists”). Abdulrahman hasn’t been to Syria for 15 years, and, as Tony Cartalucci noted, is “a member of the so-called ‘Syrian opposition’ and seeks the ouster of Syrian President Bashar Al Assad.” Further, Cartalucci explained, “Abdul Rahman’s operation is indeed funded by the European Union and a “European country” he refuses to identify.” So not an impartial source. Different casualty lists and difficulty confirming accuracy of any of them. 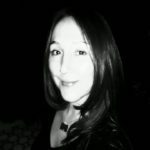 Lack of information on: how deaths were verified and by whom and from what motivation. Jay Tharappel looked at two of the other prime groups cited regarding casualties in Syria: the Syrian Network for Human Rights (SNHR) and the Violations Documentation Center (VDC). One example he cited was the listing of a Jaysh al-Islam militant, ‘Hisham Al-Sheikh Bakri’, killed by the SAA in Douma (infested with Jaysh al-Islam terrorists), in February 2015, which al-Masdar News reported. The VDC also listed ‘Hisham Abd al-Aziz al-Shaikh Bakri’, “however this one is listed as an adult male civilian and not a Jaish Al-Islam fighter,” Tharappel wrote. Every day the opposition gives a death toll, usually without any explanation of the cause of the deaths. Many of those reported killed are in fact dead opposition fighters, but the cause of their death is hidden and they are described in reports as innocent civilians killed by security forces, as if they were all merely protesting or sitting in their homes. Public figures like Owen Jones, and pro-Palestinian sites like the Middle East Eye and the Electronic Intifada, have a following for their more palatable (and safe) solidarity stance on Palestine, but routinely spew rhetoric against Syria, which is then echoed by their well-intentioned, if very misinformed, followers. Much of grassroots “Leftists”’ anti-Syria propaganda is as poisonous as corporate media. Routinely, at ostensibly anti-war/anti-Imperialist gatherings, the anti-Syria narrative is predominant. Yet, it is known that from the beginning, in Dara’a and throughout Syria, armed protesters were firing upon, and butchering, security forces and civilians. Tim Anderson’s “Syria: how the violence began, in Daraa” pointed out that police were killed by snipers in the March 17/18 protests; the Syrian army was only brought to Dara’a following the murder of the policemen. Additionally, a storage of protesters’ weapons was found in Dara’a’s al-Omari mosque. Prem Shankar Jha’s, “Who Fired The First Shot?” described the slaughter of 20 Syrian soldiers outside Dara’a a month later, “by cutting their throats, and cutting off the head of one of the soldiers.” A very “moderate”-rebel practice. In “Syria: The Hidden Massacre” Sharmine Narwani investigated the early massacres of Syrian soldiers, noting that many of the murders occurred even after the Syrian government had abolished the state security courts, lifted the state of emergency, granted general amnesties, and recognized the right to peaceful protest. May 2011 video footage of later-resigned Al Jazeera journalist Ali Hashem shows fighters entering Syria from Lebanon, carrying guns and RPGs (Hashem stated he’d likewise seen fighters entering in April). Al Jazeera refused to air the May footage, telling Hashem to ‘forget there are armed men.’ [See: Sharmine Narwani’s “Surprise Video Changes Syria “Timeline””] Unarmed protesters? What sectarianism we see in Syria today was delivered primarily by the Wahabi and Muslim Brotherhood (MB) regimes of Saudi Arabia and Qatar and by Turkey, with NATO’s blessing and backing. The cross-sect make-up of both the Syrian State and the Syrian army alone speaks of Syria’s intentional secularism, as well as the prevalent refusal of average Syrians to self-identify along sectarian lines. On the other hand, from the beginning, the West’s “nonviolent protesters” were chanting sectarian slogans, notably, “Christians to Beirut, Alawis to the grave.” Other popular chants included: calling for the extermination of all Alawis; pledging allegiance to Saudi-based extremist Syrian Sheikh Adnan Arour and to extremist MB supporting Egyptian Sheikh, Yusuf al-Qardawi. The Houla massacre of over 100 civilians on May 25, 2012, which only 2 days later the UN claimed—without an investigation— had been committed by the Syrian Army. [See Tim Anderson’s detailed rebuttal, “The Houla Massacre Revisited: “Official Truth” in the Dirty War on Syria” In the same article, Anderson also looked at the August 2012 Daraya massacre of 245 people and the December 2012 Aqrab massacre of up to 150 villagers. The August 2013 massacre of at least 220 civilians (including a fetus, many children, women, elderly) and kidnapping of at least 100 (mostly women and children) in villages in the Latakia countryside. The December 2013 massacre of at least 80 residents (many “slaughtered like sheep”, decapitated, burned in bakery ovens) in Adra industrial village. Yet, in spite of outside forces attempts to sow sectarianism in Syria, the vast majority of Syrian people refuse it. Re-visiting Syria in July 2015, Professor Tim Anderson recounted that Latakia alone “has grown from 1.3 million to around 3 million people – they come from all parts, not just Aleppo, also Hama, Deir eZorr, and other areas.” He also visited Sweida, a mainly Druze region, which has accommodated “135,000 families, mainly from Daraa – others from other parts”. Mainly Sunni families. …“Civil war” is the absolute last term that could be used to describe the war on Syria. In 2002, then-Under Secretary of State John Bolton added Syria (and Libya, Cuba) to the “rogue states” of George W Bush’s “Axis of Evil,”…meaning Syria was on the list of countries to “bring democracy to” (aka destroy) even back then. General Wesley Clark’s revelation of US plans to destroy the governments of Iraq, Syria, Lebanon, Libya, Somalia, Sudan, and Iran. Seymour Hersh’s 2007 “The Redirection” on NATO and allies’ arming and training of sectarian extremists to create sectarian divide in Lebanon, Syria and beyond. The 2009 Brookings Institution report, “Which Path to Persia?”, on plans to weaken Syria and Lebanon, to later attack Iran. U.S. funding to the Syrian opposition began flowing under the Bush administration in 2005. Since its founding in October 2011, the Syrian National Council has received $20.4 million from Libya, $15 million from Qatar, $5 million from the UAE. Britain was organizing an invasion of rebels into Syria. This operation goes way back. It was prepared, preconceived and planned. In July, 2015, Press TV reported that terrorists caught in Aleppo confessed to receiving training by US and Gulf personnel in Turkey. Given all of this, and America’s plan to train up to 15,000 more “rebels” over the next three years, it is beyond ridiculous that the inappropriate term “civil war” continues to be propagated. He outlined the flow of weapons and terrorists from Libya to Syria, via Turkey, “coordinated by US State Department officials and intelligence agencies in Benghazi – a terrorist hotbed for decades,” as well as weapons from Eastern Europe. Earlier “moderates” include the Farouq Brigades‘ (of the so-called “FSA”) organ-eating terrorist “Abu Sakkar,” and those numerous “FSA” and al-Nusra militants who committed the massacres listed above, to name but a portion. Human Rights Watch, Amnesty International, Avaaz, Moveon, and lesser-known, newly-created groups like The Syria Campaign, The White Helmets, and Action Group for Palestinians in Syria, are complicit in war-propagandizing and even calling for a (Libya 2.0) no-fly-zone bombing campaign of Syria. Vigilant Twitter users have called out HRW’s lying Ken Roth for tweeting a photo he claimed to be Aleppo’s destruction from “barrel bombs” but which was, in fact, Ayn al-Arab (Kobani) post-Da’esh attacks and US-coalition bombs. In another outrageous case, Roth tweeted a video of the flattened al-Shuja’iyya neighborhood of Gaza, devastated by Israeli bombing in 2014, purporting it to be Aleppo. Again, he was called out, forcing a weak retraction. Post-retraction, he tweeted yet another image of destruction, again claiming it to be from “Assad’s barrel bombs” but which was according to the photo byline Hamidiyeh, Aleppo, where “local popular committee fighters, who support the Syrian government forces, try to defend the traditionally Christian district” against ISIS. This is an amazing statement, effectively sanctioning the supplying of arms to insurgents who agree to follow ‘humanitarian’ rules of war. relied on groups “either based in, or receiving funds from, Turkey, USA or one of the other countries heavily involved in seeking overthrow of the Damascus government. The goal is to prepare the public for a “No Fly Zone” enforced by US and other military powers. This is how the invasion of Iraq began. This is how the public was prepared for the US/NATO air attack on Libya. The results of western ‘regime change’ in Iraq and Libya have been disastrous. …Avaaz is ramping up its campaign trying to reach 1 million people signing a petition for a “Safe Zone” in Syria. Vanessa Beeley’s “‘White Helmets’: New Breed of Mercenaries and Propagandists, Disguised as ‘Humanitarians’ in Syria” further flushed out the propaganda elements of the WH operation and their parroting of the MSM/HR industry anti-Syrian rhetoric. A district of Damascus formerly housing over one million residents, of whom 160,000 were Palestinian refugees, according to the UN, the rest Syrians, the plight of Yarmouk neighbourhood has been used by “humanitarian” campaigners to pull at heartstrings and to further confuse supporters of Palestine on the subject of Syria and the State’s treatment of Palestinians. In fact, Syria has been one of Palestine’s greatest advocates and friends, providing Palestinian refugees in Syria with a quality of life equal to that of Syrians, including free education, health care and other social services. The same cannot even remotely be said of any of Palestine’s neighbouring countries, where Palestinian refugees languish in abysmal refugee camps and are denied the right to professional employment, and affordable and quality health care and education, much less dignity. The United Nations, the HR industry, and the media obfuscate on Yarmouk, ignoring or whitewashing both the presence of various terrorist groups and the role of some Palestinian factions in enabling these groups entry, as well as fighting alongside them against the Syrian government. Talking heads also pointedly ignore the Syrian government-facilitated evacuations of Yarmouk residents to government, community, and UN provided shelters. They likewise ignore the documented repeated and continuous terrorists attacks on government and other aid distribution within the neighbourhood, as well as on anti-terrorist demonstrations held by Yarmouk residents. Who are the remaining civilians and why are they refusing to evacuate to outside shelter like so many others? Local humanitarian relief supervisors report (personal communication) that some of them are not from Yarmouk and some are not Palestinian. They include the families of Syrian and foreign fighters that are trying to overthrow the Syrian government by force of arms, and some of them came from districts adjacent to Yarmouk, such as the Daesh stronghold of Hajar al-Aswad. The Syrian government has every right to blockade the border areas between Yarmouk and Damascus to prevent extremist gunmen from entering the capital. I have been in Yarmouk several times, including last year, and have talked to aid workers inside the camp, including UNRWA. The Syrian government, in their view, assists in getting aid and food to refugee populations inside the camp – contrary to western narratives and those activists like the EI activists…most of whom appear not to have set foot inside Yarmouk since the early days of the conflict. Although the figure of 18,000 remaining Palestinians in Yarmouk may have been accurate in October 2013, today, after the evacuation of thousands, anti-Syria publications continue to cite 18,000. Journalist Lizzie Phelan, who visited Yarmouk in September 2015, says the number remaining is around 4,000. …ISIS originally launched a successful offensive at the Yarmouk Camp District in the month of March; however, after a joint counter-assault by the PFLP-GC, Fatah Al-Intifada, the Palestine Liberation Army (PLA), and members of Aknef Al-Maqdis; ISIS was forced to withdrawal to the southern sector of the district, leaving only the southern axis under their control. Sharmine Narwani’s “Stealing Palestine: Who dragged Palestinians into Syria’s conflict?” is essential reading, to understand the current situation in Syria vis-a-vis its Palestinian refugees. As for Palestinians themselves, the Syria Solidarity Movement published a statement which emphasized that “more than 1101 Palestinian groups and individuals declare their solidarity with the Syrian people and the Syrian state.” Signatories include Jerusalem’s Archbishop Atallah Hanna, the Palestinian Popular Forum, Yarmouk, and other Palestinian Yarmouk residents. Israel has on more than one occasion used prohibited chemical and other weapons on the locked-down nearly 2 million Palestinians of Gaza. During the 2008/2009 Israeli massacre of Gaza, the Israeli army rained white phosphorous on schools sheltering displaced Palestinian families, on homes, and on hospitals (of which I gathered video, photo and witness evidence at the time). Israel also used DIME on the Palestinians of Gaza. Yet, Israel remains unpunished, and receives ever increasing billions of dollars and new weaponry every year. Nor has the US ever been held accountable for its widespread criminal use of CW, such as on the people of Vietnam, of Iraq. The US and HR actors have repeatedly—and without evidence—accused Syria of using Sarin gas, then Chlorine, accusations which have been amply refuted. Seymour Hersh’s probe on the sarin attacks was so damning US mainstream media wouldn’t print it. Turkish security forces sarin in the homes of Jabhat al Nusra fighters. Evidence of video manipulation in the Ghouta attacks. The Interventionalists have tried repeatedly to accuse the Syrian government of CWs usage; yet the real criminals remain at large. Syria’s Permanent Representative to the UN, Dr. Bashar al-Ja’afari, in May, 2015, said that spreading incitement and lies on Syria is a blatant violation of UN Security Council (UNSC) Resolution No. 1624 for 2005 and of journalism ethics if any, SANA reported. Syrian media, which attempts to report the reality of Syria under attack, has been repeatedly targeted, something the MSM refuses to acknowledge (See: Media Black-Out on Arab Journalists and Civilians Beheaded in Syria by Western-Backed Mercenaries). As the NATO-alliance pushes for a “safe zone”…meaning a “no-fly zone” for the purpose of bombing Syria, anti-war activists and journalists must denounce the lies of anti-Syria governments and “human rights” groups, and must share the truth of Syria’s war against terrorism. Since drafting this lengthy Syria-101 overview, there have been major shifts in Syria’s war against foreign-backed terrorism, namely Russia’s recent airstrikes against Da’esh and co. This increase in Russian support for Syria—with Russian planes destroying more Da’esh and other western-backed terrorists and their training camps in just a few days than the US coalition has over the past year—is a turning point in the war on Syria. Predictably, corporate media are pulling all the stops to demonize Russia‘s involvement, although Russia was invited by the Syrian government to do precisely what it is doing. Those following Syria closely have echoed what Syrian leadership has said for years and continues to say: the way to stop ISIS and all its brethren terrorist factions, and to bring security to the region, is to cease arming, financing, training and funneling terrorists and weapons into Syria, silence the sectarian indoctrination coming from Gulf extremist sheikhs, and support the Syrian army and allies in their fight for security and stability in Syria. WoW! Talk about a ton of ‘un-spin’ information! Thank you for putting all this info in one spot. I will use it to help de-propagandize friends & family! Good luck, Mike, I hope they are receptive! The most excellent debunking of propagandist myth in one place I have come across so far. Will now be visiting site whenever you post. Reblogged this on International People's Coalition for Humanity.